A new cocktail that allows sodium ions to pour into cells makes tadpoles grow new tails. A similar one could be used to regenerate human spinal cords and lost limbs. It's clearly possible to grow muscle tissue, nerves, and organs. We all did it once. We should be able to do it again. For some reason, though, we can't. After a certain stage of life, or after certain injuries, tissues scab over instead of growing anew. The exact reason why they do this has puzzled many. Now one solution may have been found by researchers at Tufts University: not enought sodium ions. 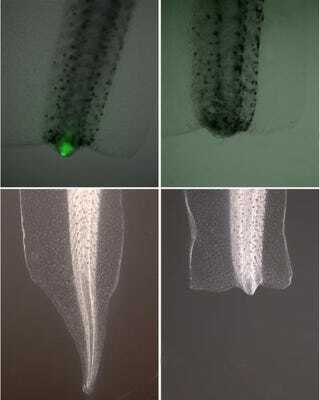 One hour of exposure to a drug cocktail which makes sodium ions pour into cells has caused tadpoles to regrow their tails (as in the image above). These are not dummy tails, like those grown by certain lizards after they lose their tails to predators. The new tadpole tails have muscle and spinal cords, just like regular tails. We have significantly extended the effective treatment window, demonstrating that even after scar-like wound covering begins to form, control of physiological signals can still induce regeneration. Artificially causing an influx of sodium for just one hour can overcome a variety of problems, such as the decline in regenerative ability that comes with age and the effect of regeneration-blocking drugs. In other words, this can help people who have been undergone chemotherapy and loss of limbs. And, of course, this is the newest idea that can make people immortal. Its most immediate possibilities, though, lie in spinal cord regeneration. Since tadpoles build tissue, including spinal cords, like people do, this could be a possible treatment for those with spinal cord injuries. Via Tufts and the Journal of Neuroscience. Image via Tufts.